The uOttawa Maker Mobile is a Makerspace on wheels. Carrying the latest technologies, the Maker Mobile delivers fun hands-on learning activities to schools, libraries and community centres across the region, complementing the school curriculum. Workshops can be bilingual and tailored to your needs! Our goal is to encourage creativity, problem-solving skills and interest in technology among everyone in the community. From September 2016 to June 2017, we have reached a total of 408 schools, over 19,200 kids and have given over 800 workshops in the National Capital Region. To book the Maker Mobile for community events or for birthday party, please inquire about availability at makermobile@uOttawa.ca. The Maker Mobile sometimes travels to other regions in Ontario and Québec. If you are interested in having the Maker Mobile come to your school or region, please contact us at makermobile@uOttawa.ca, call us at 613-562-5491 or sign-up to be notified if we are visiting your region. Exception: Advanced 3D printing or Laser cutting workshops are each between 2 and 2.5 hours. These two workshops count as two workshops in the schedule. The number of participants applies to workshops only. If you want us to be present as a kiosk at your next event, please indicate this in the request. Our dynamic instructors will come to your school with the Maker Mobile! The teacher must always remain in the classroom and will be required to complete a short evaluation at the end of the workshop. Classroom or laboratory with at least 2 electrical outlets. Weather permitting, the workshop could be held outside in a parking lot or on school property. We have tables and stools for all students. “Advanced 3D printing” and “Laser cutting” must be the first session booked in the morning or afternoon since these workshops are a minimum of 2 hours. This is to allow for processing time of printing or cutting. For this reason, there's a maximum of two “Advanced 3D Printing” or “Laser cutting” workshops that can be booked each day. Please note that each workshop is tailored for your class's grade and ability. In this interactive workshop, participants will be introduced to this new technology, and will discover its functionality and applications. 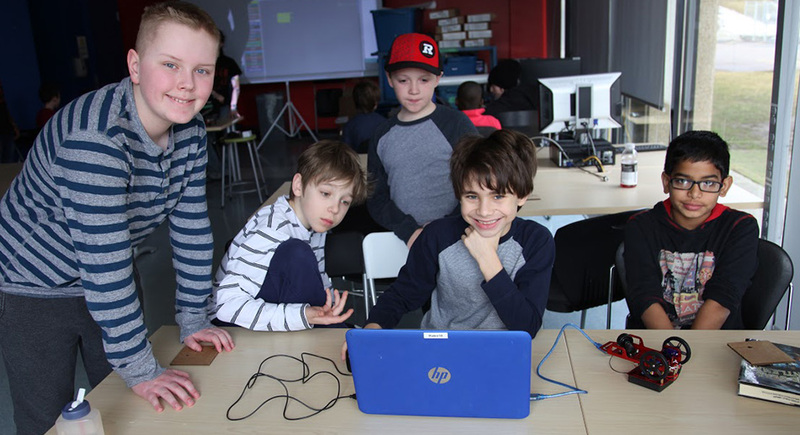 In small groups, they will have the opportunity to create their own 3D model of a Lego character’s head using Tinkercad, a user-friendly 3D modeling software. We won't have time to print each individual student's design, but each student will get an example, 3D printed during the workshop. In this advanced interactive workshop, participants will discover this new technology from how it works to its multitude of uses. They will have more time to create their own 3D model in small groups using Tinkercad, a user-friendly 3D modeling software. Depending on their grades, they will design a more complex prototype then during the Introduction workshop. Next, they will learn how to print their design with the 3D printers, and turn it into reality. During the printing time, students will also work on more design challenges. Students will turn a 2D drawing into a 3D shape, which they can use as a cookie cutter. Students will create their own character while investigating the 3D design process. Students will learn how to design in 3D and build their own catapult using a 3D printed part and other materials. Science: Students will design a top. They will investigate forces, inertia and torque as well as the design process. In this interactive workshop, students will get a chance to learn about microcontrollers by programming an Arduino board and controlling its various inputs and outputs (lights). In this day and age, open source microcontrollers like the Arduino have become mainstream and have been adopted by electronic hobbyists around the world. This workshop gives participants a good introduction to the world of electronics and electrical engineering. This workshop is to be booked as a second workshop after the first Arduino workshop or for students with previous programming experience. More advanced programming concepts such as loops and arrays will be explored. Bee-Bot is an award-winning programmable robot, perfect for teaching orientation, sequencing, estimation and programming to young children. Students will have the opportunity to complete the challenge of programming their Bee-Bot to make its way through a maze. Students will learn to program their own interactive stories and games. In the process, they will learn to solve problems, design projects and express themselves creatively on the iPad or laptops. We will provide the iPads or laptops for this workshop, so access to other computers is not necessary. In this interactive workshop, students will learn basic coding concepts and will create their own game using a Micro:bit board. A Micro:bit is a small board, half the size of a credit card, that has a micro-processor, accelerometer, sensors, a display of 25 LEDs and two programmable buttons. It’s now used around the world to encourage children to get actively involved in writing software and building new things. In this hands-on workshop, students will design, build and test simple parallel and series circuits. They will investigate different electrical components such as transistors and switches. In this interactive workshop, students will learn the step-by-step process of Engineering Design, from conceptualizing, to designing and creating renewable energy by making wind turbines. Students will learn how to transform the wind’s kinetic energy into electrical energy using their wind turbine. They will get to design, build and test their prototypes and will have to adjust their design in order to produce the most energy. Our giant light board will be used to show the amount of electricity that they produced. The Engineering design process includes many steps. The first part of this workshop will be to design their turbine. After having built their wind turbine, students will have a chance to test it and will return to their station to adjust their product for the final competition. In this hands-on workshop, students will learn about solar energy. They will investigate, test and compare solar panels in series and parallel circuits by measuring electrical voltages and currents. This workshop is all about using a high precision laser to cut and etch materials. Using the software Inkscape, participants will design a project in 2D, that will be cut by the laser, and assembled to make a 3D object. They will learn all about this versatile tool and its applications. Students will design and build a small bird house made of cardboard (in teams of 2-3) that will be laser cut. Students will create a 3D airplane from a 2D design (in teams of 2-3) that will be laser cut. Students will create a 3D box from a 2D design (in teams of 2-3) that will be laser cut. Science: Students will learn about the benefits and challenges of a nature bridge (a place where animals cross the highway). Students will then design their own nature bridge (in teams of 2-3) and cut it out of cardboard on the laser cutter. Technology: Students will design a chair to scale (in teams of 2-3), and cut it out of cardboard on the laser cutter while learning about the design process. 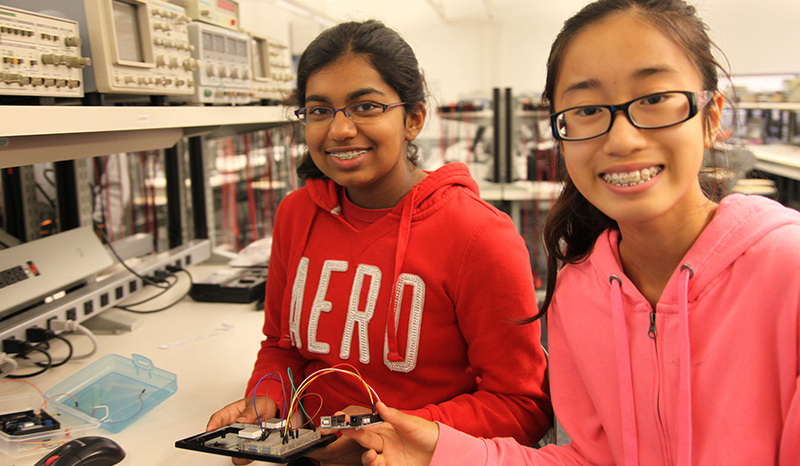 In this hands-on workshop, students will investigate circuits and computer logic using electronic building blocks called Little Bits, while learning some basic programming concepts. In this hands-on workshop, participants will get the chance to bring together digital and physical worlds by programming a small car robot to go through a maze. Concepts of vectors and programming will be introduced. In this interactive workshop, students will learn robotics basics using Jade Robots, an educational robot designed to engage and excite youth about STEM. Using basic coding concepts, they will program their robot to make it draw a creative art piece! The goal of this workshop designed specifically for parents, tutors or guardians is to teach them how to code and enable them to support their children in developing this new skill. Coding is a new skill that we believe every child should learn. It is the best way to understand technology and allows kids to develop problem-solving, critical thinking and logic, while encouraging creativity! Since coding can be learnt at a very young age, we will be running a 2-hour long workshop, divided in two parts of one hour each. Part one: Coding for parents of grade K-3 using Scratch Jr on iPads. Part two: Coding for parents of grade 4-8 using Scratch on laptops. Parents can choose to participate to either or both parts of the workshop. Participants will be able to learn the basis of coding by doing hands-on activities, such as coding simple stories, using iPads or laptops that will be provided. When: Workshops can be held as an after school activity. You may choose a date that is convenient for your school to be holding the workshop. Another option that could be offered to your school would be a “Coding night for families”, where both parents and children would learn to code together (maximum of 30 families).